Asian Side (Turkish: Asya Yakası, or, more usually, Anadolu Yakası, i.e. “Anatolian Side”) is the eastern half of the city of Istanbul, located east of Bosphorus and geographically on the Asian mainland. Before setting sail to find a suitable place for a colony, Byzas, legendary founder of Byzantium, was told by soothsayers that he was going to found new city across the water from the land of the blind. Then, one day, during his pursuit of the new land, he set foot on a beautiful, forested, and easily-protectable peninsula, surrounded by the sea from three sides. On one side, there was a deep and long bay, too, where storms of open seas have little effect, perfect for a harbor. Looking more carefully, he saw some fishermen inside the bay. After learning that they are from Khalkedon across the Bosphorus, he remembered the prophecy, and convinced that they were indeed ‘the Blind’, who couldn’t see the wonderful land he was standing on and preferred to build their city in a rather inconvenient location. Soon thereafter, Byzas set the first stone of what has become the city of Istanbul, and Khalkedon (today’s Kadıköy) got the nickname ‘the Land of the Blind’. Kadıköy (ancient Khalkedon) and Üsküdar (ancient Chrysopolis/Scutari) forms the historical cores of this part of the city. Both started as cities independent of Istanbul (in fact Khalkedon was founded about 30-40 years earlier than Istanbul itself), and only incorporated into the city of Istanbul in late 19th century. It’s no coincidence that the regular steamer services across the Bosphorus was started a few years earlier in the 1840s. Today Kadıköy and Üsküdar are mainly commercial zones. The rest of this part of the city mainly consist of soulless suburbs full of quiet high-rise apartment blocks, most of which date back no more than 30 years (which, again, is no coincidence that the first inter-continental Bosphorus bridge was constructed a few years before in 1973). 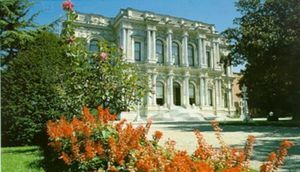 Major exceptions are the Bosphorus bank, with its historical palaces, mansions, and neighborhoods with a character; and the coast of the Sea of Marmara, all along which lies a lovely (and, unsurprisingly, long) park on the edge of which a number of impressive wooden mansion lie. Known as the less crowded and more orderly half of the city, Asian Side nonetheless houses about 4.4 million people, or one of every three Istanbulites, out of which around 1.3 million commute daily to Europe. Sabiha Gökçen Airport (SAW)  is located on Asiatic Side, about 20 km east of Kadıköy. To get to the centre from there, you can take public bus E10 which brings you to Kadıköy in 70 minutes (7 YTL). You can also alternatively take Havatas bus which connects the airport with Taksim on the European Side for 14TL and Kadıköy for 8TL. Haydarpaşa Station, which is the main station of Istanbul for Asian destinations is located about 5-10 min walk away from downtown Kadıköy. Drop by if you are nearby, even if you have no plan to take a train, since the station building, built by the German in 1908 in a distinctive Teutonic-castle style, is a sight in itself. It’s rumoured that the architectural style of the building was deliberately chosen, because, in the age of railways, it was the point where passengers from deep inland Asia have their first sight of Europe, located across the Bosphorus. Likewise, Sirkeci station -main station of European Side- which has a similar duty for passengers from Europe, has a distinctive Oriental style. Due to a major project to upgrade the train system so that it can use high-speed trains, as of February 2012 all trains to/from Haydarpaşa have been stopped during construction, until 2014. Harem is the name of the major terminal of this side, and the first place of call in Istanbul of many buses from Asian Turkey. It’s located at about the mid-way between Üsküdar and Kadıköy and has frequent ferry links with Eminönü/Sirkeci. Fast ferries from places on the southern coast of the Marmara Sea, such as Yalova or Bandirma are available to Bostancı pier. Some are direct, while others transfer to a smaller ferry after arriving at Yenikapı pier of European Side. The fastest option travelling between the European and Asian Side of Istanbul is by Marmaray. It connects the stations Ayrılık Çeşmesi and Üsküdar with the European Side. The Marmaray also connects with the Metro Line 1 at Yenikapı, making the transfer to/from Atatürk Airport easy, too. A liner approaching Kadıköy jetty. Topkapı Palace across the Bosphorus can be seen in the background. Fast ferries from places further away like Bakırköy are available to Kadıköy (separate from liner pier) or Bostancı pier. But they are much more expensive than liners. The metrobüs (#34A), which connects Edirnekapı just out of old city walls in European Side with Söğütlüçeşme just east of downtown Kadıköy (about 15-20 min away on foot) via Mecidiyeköy and a number of other stations on the way, is a very quick option thanks to its special lanes segregated from all other traffic, except a short section actually on the bridge itself, though they are still much better than conventional buses, even on the bridge. Although metrobüs stations are usually a little off the usual tourist trail, they are easily accessible from more central locations by a variety of public transportation, including the metro from Taksim Square for Mecidiyeköy station. #34A is a single-ticket line despite crossing the Bosphorus. In late 19th century, Jules Verne wrote Kéraban-La-têtu (Keraban the Inflexible), in which he depicted a fictional Keraban Agha, a resident of Üsküdar, who was known for his stubbornness. According to the plot, one day when Keraban Agha wanted to take his two Dutch guests to his home from Galata, officials reminded him of a new tax levied by the government: From thenceforth anyone who wished to cross the Bosphorus should pay a fee of 10 para. Keraban, as much obstinate as he could be, of course declined to pay the tax to the government he disapproved. But still wanting to take his guests to his home across the Bosphorus, he leaded the wrong way: They encircled the whole (~4000 km) coastline of Black Sea via Bulgaria, Romania, Crimea, Northern Caucasus, Abkhazia, and northern Turkey. The trio arrived at Keraban’s residence after a 45-day jouney. In December 2008, a group of Turkish artists “repeated” the journey, under the name “In the Footsteps of Jules Verne.” Being forced to arch around Moldova to avoid conflict zone of Transnistria, and being unable to cross the Russian-Georgian border, as well as running into many other less significant problems at other border crossings, artists, upon completing their 14-day journey, declared that it was even harder to follow the same route after 125 years. There are dolmuş lines operating almost 24 hours between Taksim-Kadıköy, and Taksim-Bostancı. They depart from the street next to Atatürk Kültür Merkezi in Taksim Square (opposite edge of the square from Istiklal Street) and cost about TL 7.00/person. See infobox to the right. Kadıköy and Üsküdar are the main transport hubs of this part of the city. From both, it is possible to find a direct dolmuş, bus or minibus line to almost anywhere in Asian Istanbul, and also to a lot of places in the European Side. Bostancı on the coast of Marmara Sea is a secondary hub, but an important one nonetheless. Dolmuşes ply between Kadıköy-Üsküdar, Kadıköy-Bostancı and Bostancı-Kadıköy until late at night.There are also Dolmuşes from Kadıköy to Acıbadem, Koşuyolu and various points. Metro line M4 operates between Kadiköy and Kartal. Tokens (jeton) can be purchased from automatic token dispensers (called Jetonmatic) at the cost of 3,00 TL. Suburban trains with frequent departures from Haydarpaşa head to Gebze out of city borders (44 km to Kadıköy), following closely the Marmara sea-shore, calling at Bostancı and a number (well, actually more than 20) of other stations on the way, including Kartal, Pendik, and Tuzla among others. A ticket (jeton) is valid for once and costs about 2,00 TL. Major roads of Asian Side mostly follow a west-east axis. These are the three major roads which connect Kadıköy with locations east (from south to north): The causeway (Sahil Yolu), which follows the coast of Marmara Sea, Bağdat Avenue (one-way, and that is east to west which means you cannot enter from Kadıköy), and the road colloquially known as Minibüs Yolu. From Üsküdar, the major road colloquially known with its former European road number E-5 lies to east towards depths of Asia, while another road also named Sahil Yolu (Causeway) connects the neighborhoods on the bank of Bosphorus in the north to Üsküdar. There is a long (more than 20 km with some short interruptions) and marked bicycle lane along the park which lies along the coast of the Sea of Marmara, starting from a few km east of Kadıköy, passing by Bostancı and eventually reaching furthest parts of the city in the east. The bikepath is well-maintained but be careful anyway: Although it’s very unlikely that you’ll come across a motorized vehicle, pedestrians –who aren’t very used to seeing bikepaths in Turkish cities- have just begun to respect the rules of bicycle lanes. Between Kadıköy and Moda, the one-way circular traditional tram route offers a pleasant short ride. However, you will likely use it for the experience, rather than as a useful transportation link. Bağdat Caddesi (Baghdad Avenue), lying parallel with (but a short dinstance away from) the Marmara coast between a few km east of Kadıköy and Bostancı to the east, has nothing to do with Baghdad, Iraq except that, during the Ottoman period, it was the beginning part of the road which connected the capital city, Istanbul with Baghdad, another important city of the empire then.This avenue had it's name because an Ottoman Sultan,Murat the IVth went to Baghdad from that avenue. In fact, with its sidewalk cafés, Bağdat Caddesi is usually considered as one of the most European-flavored street of Istanbul nowadays, ironically located on Asia. This street is not completely pedestrianized like the Istiklal Street of the European Side, but its broad sidewalks shaded with trees offer a pleasant walk. The restaurants and cafés on the avenue are mainly upscale, but there are also some quite affordable ones scattered around occasionally. Shopping opportunities also abound. From Kadıköy, take ‘Bostancı’ dolmuş (they depart from near that big yellow balloon) or public bus #4 (its stop is also near the balloon, but separate from dolmuş stop). Çamlica Hill — One of the highest hills of Istanbul (268 metres high) and almost all major broadcasting antennas are located on this hill, since the hill dominates a great part of the city. On the top of the hill, a public park with cafes remind the visitors of an Ottoman atmosphere. Thıs public park is sponsored by the government so expect lower prices on food and drink than usual. The cafe located in a building at the top of the hill is moderately expensive, don't worry about it though because you'll get excellent food and service. As aforementioned, Haydarpaşa Station, built in a turn of 20th century in German style is well worth a look and can be easily walked to from Kadıköy. Further to the north of Haydarpaşa station and a little difficult to find (it is surrounded on three sides by Turkish military barracks) is the British cemetery with an obelisk commemorating the Crimean war and many Crimean war, Victorian era (and later) graves as well as a modern British and Commonwealth war graves cemetery. Anadolu Kavağı, with its impressive citadel named Yoros on the hill, is the northernmost part of Asian Istanbul, but ironically, easier to get to from European Side. See Istanbul#Get out for more details. Yakacık Hill, located in a quite distant part of Asian Istanbul (approximately 20 km east of Bosphorus) in Kartal (ancient Kartalimen) district has a great view of the city. Water springs and the Aydos Hill (537 m), which is the highest point of Istanbul, are the other remarkable destinations in the region of Yakacik. İçmeler near Tuzla has the only hot spring in Istanbul. Kalamis Yacht Marina (Kalamis). A nice walk inside and around the marina and plenty of cafes and restaurants are available for eating and drinking.Kadikoy-Botanci Yellow Dolmushs serves nearby.Ask the driver for kalamis Marina to hop off. Ride the balloon (Turk Balloon) in Kadıköy (easily recognizable by its yellow color on Kadıköy coast). Although it doesn’t stray much away from its base –since it is always tied to the ground by a rope- it offers a view of much of Istanbul –both European and Asian Sides- from a height of 200 meters. You can do shopping in Kadıköy, Üsküdar and Bağdat Street. The sale (prices %50 off) season for winter is after New Years Day and for summer after July. Balık-ekmek (literally “fish-bread”, a grilled fish sandwiched inside half a bread) is an increasingly popular low-budget meal in buffets in Kadıköy coast, which can be had for TL 3-3.50. Tike Kebap Şaşkınbakkal, Kazım Özalp Caddesi 58, Kadıköy, ☎ +90 216 467-59-14 ([email protected], fax: +90 216 467-52-43), . 1PM-midnight. 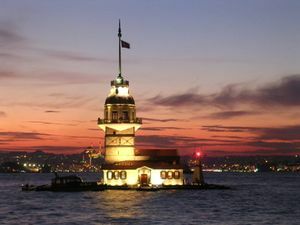 A luxury traditional restaurant for tasting Turkish kebab on the waterfront avenue (Sahil Yolu). From 30-40 TL/pp. edit. Kadıköy has a nightlife scene of its own, smaller than Beyoğlu of European Side, but as lively. From the quay where liners from Eminönü arrives (signed as Eminönü Karaköy İskelesi), first cross the main street, then turn right, from the corner where Starbucks is located, turn left. You’ll come across two churches facing each other, turn right there. On that street and the upper one parallel to it, you’ll find lots of bars (some of which offer live music), pubs, and Turkish taverns. A few blocks uphill from there is the street colloquially known as Barlar Sokağı (Turkish for “Street of Bars”), where there are more places for a drink. If you can’t manage to find that street, ask which direction Rexx Sineması (pronounced racks see-neh-mah-sa) is to young people around. That cinema/movie theater is very near that street, and is widely known. Caddebostan Balans Brau , very nice place for beer(especially own-made weisbier and sausage. On the Bağdat Street. A'jia Hotel, Çubuklu Caddesi No:27, Kanlica, +90 216 413 9300 (fax: +90 216 413 9355, [email protected]), . A unique boutique hotel located on the Asian side of the city facing the beautiful Bosphorus. Rooms include air-con, TV, safe, wi fi. Rooms range from -850. Hotel Suadiye, Plaj Yolu, 25, 34740 Suadiye, +90 216 445 84 24 (fax: +90 216 445 20 02, [email protected]), . A 4 star hotel located on the Sahilyolu,very close to the Bağdat Avenue. Rooms include air-con, TV, safe, wi fi. Rooms range from for 3 persons. The area code of this half of the city is (+90) 216, which is different from the European Side. This page was last edited on 10 January 2017, at 21:50.